Gaylord Tilter (GLT) provide full-service material handling for Gaylord boxes and other bulk containers. An adjustable restraint bar holds all types of pallet-sized boxes in place for dumping contents. Alternately, closed hydraulic circuits position boxes for ergonomic access for workers, limiting risky movements like stretching and bending as staff members empty the contents. Corrugated cardboard Gaylord boxes are the industry standard for shipping small, loose materials, but they pose ergonomic risks when staff must bend to access contents. Gaylord Tilters prevent this motion, which is commonly associated with costly and painful musculoskeletal disorders. 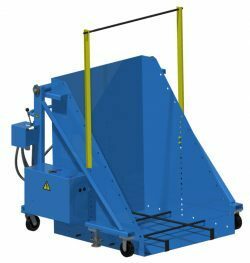 While Gaylord Tilter were designed specifically for Gaylord boxes, they’re also efficient work positioners for a wide range of bulk containers, including pallet bins and stackable steel boxes. Choose between models rated for loads of 2,000 pounds or 4,000 pounds. Both designs feature rugged steel construction and an impact- and chemical-resistant powder coating for optimal strength and durability. Custom-designed Gaylord Tilter are also available to meet unique specifications. Learn more about Gaylord Tilter and other Stationary Tilt Tables from BHS by calling the sales team at 1.800.BHS.9500.